Immunogen: Synthetic peptide corresponding to a portion of human CK2α (casein kinase 2α). The sequence is completely conserved in mouse, rat, rabbit, chicken, Xenopus, zebra fish, Drosophila and C. elegans. Application Notes: Detects band of ~41kDa and ~45kDa by Western blot. An additional band with an apparent molecular mass of ~38 kDa is detected in brain and heart tissue extracts. Scientific Background: The casein kinases are serine/threonine protein kinases involved in the regulation of multiple cell signaling pathways. There are at least seven identified mammalian isoforms in the casein kinase I (CKI) family, which are monomeric and function in cell growth and the replication and repair of DNA. Casein kinase II (CK2) is a ubiquitous tetrameric holoenzyme comprised of two catalytic alpha subunits and two regulatory beta subunits. 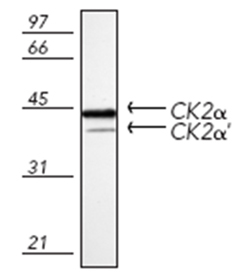 CK2 enzymes are known to regulate metabolic signal transduction, transcription, and translation. Western blot analysis of mouse spleen tissue extract, probed with Casein Kinase 2 alpha polyclonal antibody (Prod. No. ADI-KAP-ST010). 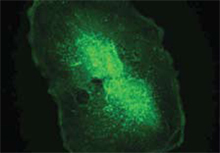 Proliferating human Caco-2 cells stained with Casein Kinase 2 alpha polyclonal antibody (Prod. No. ADI-KAP-ST010).